Constructed by Sienar Fleet Systems, TIE fighters were the space attrition platform for the Galactic Empire. 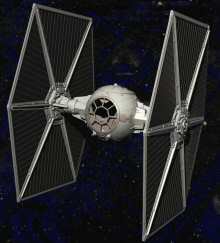 While highly maneuverable, TIE fighters had minimal or no shielding and were easily destroyed. The TIE Pilots themselves, had to trust their adept flying and combat skills to compensate for these weaknesses. They did not carry missile tubes in standard configurations, but these were sometimes added as necessary. The fighters had no landing gear and were launched from specialized racks, although they are structurally capable of sitting on their wings. Life-support systems were not included, so each pilot had a fully-sealed flight suit (of superior construction to that of his Rebel counterpart).